Dr. Tripathi’s research is focused on drug discovery and mechanistic evaluations of natural products. It include development of new high throughput screens for drug discovery, genomics, molecular biology, gene expression, and biological characterization of natural products. Dr. Tripathi is conducting high throughput screens for drug discovery, performing mechanism of action studies on natural products, and evaluating the in vitro activities of new compounds. The molecular pathways identified are being validated using genetic and biochemical approaches, and further used to identify new compounds that disrupt these targets. 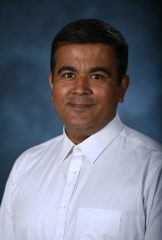 Dr. Tripathi is also conducting next generation sequencing (NGS) experiments, including DNA and RNA-Seq, data analysis and interpretation and assisting other researchers in their NGS needs.